After the tragic events of September 11, 2001, a great deal of focus and talk has been spent on the security of the United States' borders. While the role of the U.S. Border Patrol has been vital in curbing illegal entry into the U.S. since 1924, it has assumed an even greater importance in the recent past. 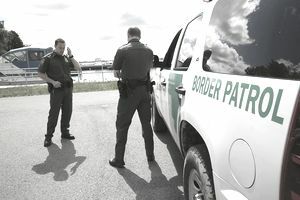 Because of the emphasis now placed on securing the nation's borders, now is a great time to consider a career as a United States Border Patrol Agent. When it was first created, the function of the border patrol was to curb illegal border crossings into the U.S. and combat the growing business of human smuggling, the process of sneaking immigrants illegally into the country. That focus has expanded throughout the years. Border patrol agents' primary focus now is to apprehend or stop dangerous criminals and potential terrorists from entering the U.S. and carrying out illegal activities and attacks. Border patrol agents work closely with other local and federal agencies, such as customs enforcement, the Drug Enforcement Agency and I.C.E. agents, to ensure legal immigrants, enterprises, and commerce remain as unimpeded as possible while at the same time preventing illegal activities like the drug trade and human trafficking. Border patrol agents work in a host of environments, including some undesirable locations. They work around the clock and in all weather conditions. To qualify as a candidate for employment as a border patrol agent, applicant's must be under the age of 40, be eligible for Veteran's Preference or have previous federal law enforcement experience. Candidates must also be U.S. residents and citizens, hold a valid driver license, and be able to pass a rigorous background investigation, including a polygraph exam, and a medical examination. In addition, candidates must speak fluent Spanish or at least be able to learn to speak Spanish. A college education is not required to become a U.S. Border Patrol agent, though there may be salary incentives available for those with at least a bachelor's degree. Upon appointment as a border patrol intern, applicants undergo extensive training at the United States Border Patrol Academy in Artesia, New Mexico. The training includes a 58-day basic academy, with courses in immigration and nationality law, applied authority, and operations. Additionally, interns who do not speak Spanish are required to take an 8-week Spanish Task-Based Language Training Program. Students who fail to meet any of the academic standards, including language proficiency, are dismissed. The importance of maintaining a secure border remains on the forefront, and problems such as human smuggling and trafficking are becoming more apparent. Because of this, the United States Border Patrol will continue to hire agents for the foreseeable future. Starting salary for border patrol agents is between $38,00 and $49,000, depending on education level. Locality pay additives are also available, and agents have opportunities to earn overtime pay as well. Additionally, an annual uniform allowance of $1,500 is provided. Securing the nation's borders is vital to preventing terrorist attacks and limiting the amount of contraband entering the country. It is also paramount to curb the growing problem of human trafficking and smuggling. If you feel that protecting the borders is a meaningful and worthwhile endeavor and are interested in working in a law enforcement capacity, a career as a border patrol agent may be the perfect career for you.